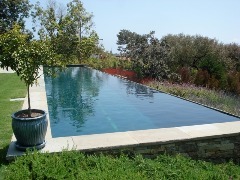 Liquid Pool Covers - Do Liquid Pool Covers Work on Infinity Edge Pools? A very common question that we receive is whether or not liquid pool covers can work effectively on a swimming pool with an infinity edge. The concern is that, since the surface water is always flowing over the edge of the pool, is it possible to establish a liquid cover in order to reduce the evaporation? The happy answer to that question is yes! Even though the water is flowing over the edge from the surface, it is consistently being re-circulated as it works its was through the circulation system. Essentially, a continuous loop is formed where product is always being moved across the surface, through circulation and back into the pool water. We have many customers with infinity edge swimming pools using Heatsavr, the original liquid solar pool cover, effectively. For best results we do recommend turning off the overflow when the pool is not in use - or being admired - such as overnight. This not only helps the liquid pool cover maintain the most reliable layer throughout the evening when you're pool is experiencing the highest heat loss, but it also reduces the amount of evaporation that is increased by having an overflow in the first place. If your overflow stays on all the time, you may find that you see better results by increasing the recommended dosage of Heatsavr slightly (1.25 oz / 400 sq. ft), though in many circumstances this is not necessary. Do you have any questions or comments that you would like to see addressed in our blog? Feel free to leave them below! If you'd like help finding a local supplier, you can email [email protected] with your City/State and we can try to find someone to help you out closer to home!